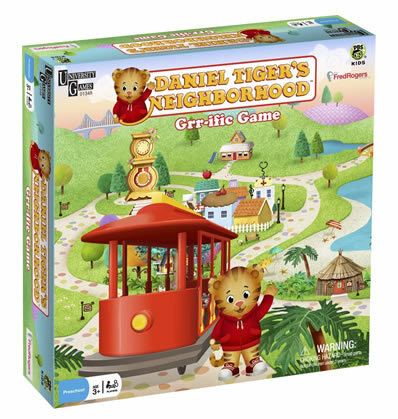 Along with the Daniel Tiger toys reviewed by the Neighborhood Archive back in August, the Daniel Tiger's Neighborhood Grr-iffic Game has been available for several weeks. I've held off on taking a closer look at this game up until this point simply because the best price I could find -- $23-25 on Amazon -- was more than I was interested in paying for what appeared to be a very simple game. Checking for any new Daniel Tiger merchandise on the Toys R Us website a few days ago, I discovered that the Grr-ific Game was much more reasonably priced right under my nose. So $16 and a quick trip to the toy store later, let's take a closer look at the Daniel Tiger's Neighborhood Grr-ific Game. The game is packaged in a sturdy square box slightly smaller than what some of you may remember as the typical size of a Trivial Pursuit box. Plenty of colorful illustrations on the top and bottom of the box -- and always nice to see Fred's face. 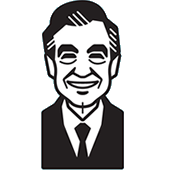 In this game intended for 2-4 players (recommended age of 3+), players begin by choosing a character to move throughout the Neighborhood. THE GOOD: The characters are fully illustrated on both sides of the pieces that are large enough for young hands to maneuver. I really like the fact that it is not the same image on both sides but rather a front/back illustration. My 3-year-old daughter thought this was pretty cool, as well. THE NOT-SO-GOOD: There are five character pieces and only four plastic bases to support them. Sure, this game is only intended for up to four players at a time so there should never be a need for any more than four bases at any given time, but frequently taking the bases on and off of these cardboard character pieces is sure to ruin them quickly. This problem could easily be avoided by including five plastic bases for these pieces -- one for each character. Players take a turn by spinning a 1, 2, 3, or 4 on the spinner and moving that number of consecutive spaces in any direction they choose. The object of the game is to travel throughout the Neighborhood gathering all five friends on the Trolley and ending at the Clock Factory. 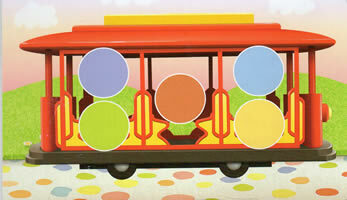 As each friend is collected, a small token with that character's images is placed on the player's Trolley card. Once all five characters are represented on a player's card, it's time to move towards the Clock Factory. THE GOOD: This provides young players with something to earn as they move throughout the game rather than just taking a turn and moving a certain number of spaces. It also allows them to easily keep an eye on their progress. THE NOT-SO-GOOD: First, these tokens are small -- each one is roughly the size of a penny. 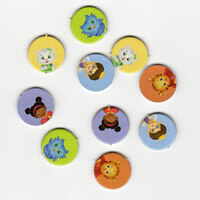 Anyone with children knows that keeping track of all 20 of these tokens (four of each character) for any lengthy period of time will be next to impossible without keeping the pieces under lock and key. Additionally, it may have just been with our particular game, but the cuts around these characters are horribly off-centered leaving half of their images on the card once they are punched out for use. This is just sloppy manufacturing. So far, I realize this game seems incredibly simple, but here's the fun part. 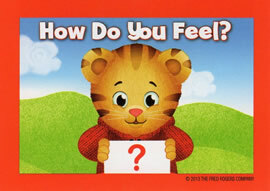 As players land on the various spaces throughout the Neighborhood, they receive their token after choosing a How Do You Feel? card or a Imagination Moment card. 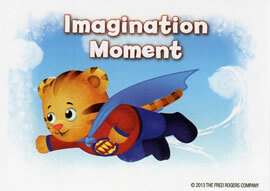 In both cases, players must act out either a specific emotion or an action found in scenes from Daniel Tiger's Neighborhood. THE GOOD: This is, by far, the most fun part of the game. My kids enjoyed spinning the spinner and collecting their tokens, but their faces lit up each time they got to pull a card and entertain guesses from the other players. THE NOT-SO-GOOD: Many of the scenes found on these cards are quite vague making them difficult to act out for others to guess. For example, Daniel wearing a cape and flying through the air is easy to mimic. Daniel sitting in his pajamas looking at a teddy bear is not. So is this game worthwhile or not? I was a bit skeptical at first, but my kids and I definitely enjoyed playing it and I expect that we will continue to play it occasionally in the future. It's a great combination of entertainment and imagination. Is it worth 25 bucks on Amazon? Probably not. Worth 16 bucks at Toys R Us? That's more like it.